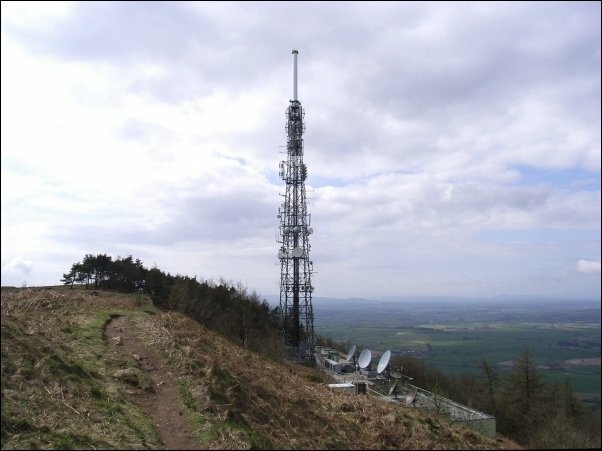 Digital switchover occurred at The Wrekin in April 2011. Although the transmitter is now a K group the three PSBs are still available off an original A group aerial, see The Wrekin graph. There are no ”Local” MUXES allocated to The Wrekin in the latest scheme. A slight chance exists of more TV channels being transmitted between CHs 31 and 37, These can by picked up be decent K groups aerials (or widebands). For The Wrekin`s frequencies see its channel allocation guide. This table also includes the same information for some of the other transmitters receivable in the area Sutton Coldfield, Waltham, Fenton, Winter Hill, Moel Y Parc, Blaenplwyf, Ridge Hill, Malvern, Bromsgrove and Brierley Hill. Note how the transmissions “dovetail” together in an attempt to minimise co-channel interference. The Channel Allocation Guides can be very useful in the diagnosis of co-channel interference problems and can also be invaluable if you are trying to find a spare channel for a modulated output (e.g. for a Sky box or CCTV system) to be added to your TV setup/distribution system without suffering from co-channel. the ex Wellington & Severn Junction line which used to run 3 miles to the East. The latter opened in 1854 and remained open until 1962, though the Telford Steam Railway now utilises a short section of the line. The Iron Bridge Museum is also close by and is definitely worth a visit. 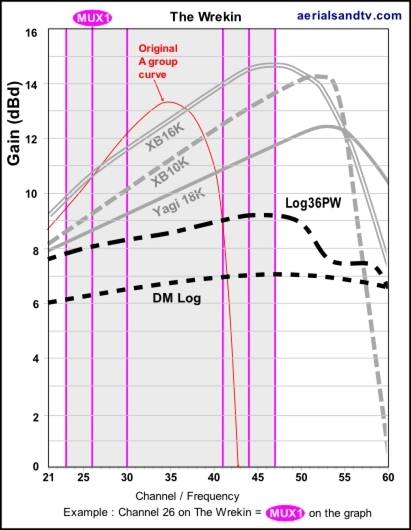 For The Wrekin we recommend the DM log for strong signal areas, the Log36 for medium signal areas, and the Yagi18K or XB10K for poor signal areas, the latter aerial being particularly well suited to loft mounting. The XB16K is for those with the most marginal signals. The dimensions and test performance of the aerials can be found on the relevant tables. The Wrekin TV Transmitter, note the fabulous view in the background. The Wrekin`s Digital transmitting arrays as they were before switchover. Note the mesh panels behind each array to restrict the radiation pattern (s). The View to the East from The Wrekin, Telford is visible centre left. The path up the hill can be quite steep but the vast majority can ascend it, taking their time if lacking fitness ! Be warned that there are three or four “false brows” on the route, you keep thinking you`re near the top, only to be confronted by another “brow” ahead of you as you reach what you thought was the summit ! It can be seen from the graph that the three PSB MUXES can be received on an A group aerial. The Wrekin transmitter`s channel guide. Also check The Wrekin`s four small repeater transmitters. 700MHz clearance occurred at The Wrekin in March 2018, nothing changed ! The Wrekin transmitter is situated 4 miles W of Telford on a 400m high hill which is called, funnily enough, The Wrekin ! The tower is about 50m high with the (analogue) transmitting array adding around 10m on top of that. It was constructed in 1975 amid great controversy due to the scenic and historic nature of the site. I can certainly testify to the former, the views are fantastic and well worth the mile and a half walk up the hill. 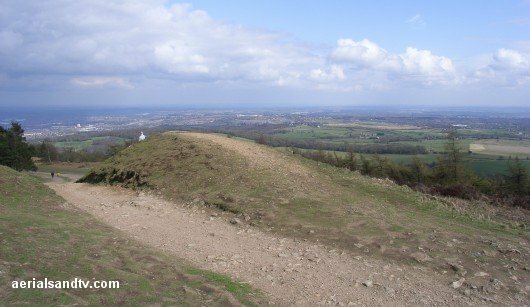 Getting planning permission for the tower was made even more problematic by The Wrekin being the site of a large Iron Age hill fort ! The BBC`s 1977 estimate for The Wrekin`s population coverage was about 160,000. Ofcom now quote The Wrekin`s maximum population coverage as being around 282,000 homes (half a million people ?) but that includes many households which will be on another transmitter with overlapping coverage. The Wrekin`s digital transmitting power is 20kW for MUXES 1 to 3 (the PSBs) and 10kW for MUXES 4 to 6. Before the April 2011 switchover digital output was only 1kW. Coverage is increased by four small repeater transmitters. 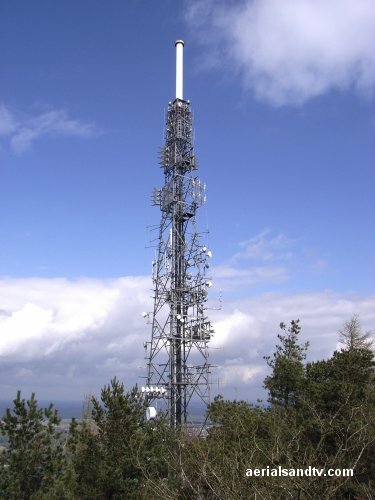 The Wrekin transmitter is Horizontally polarised and was originally an A group for analogue but for digital it is now a K group [or wideband]. Below is a close up of the panel showing all the features which could be visible from the top. It was erected by the Rotary Club for the Queen`s Silver Jubilee in 1977.